The interaction of magma with water near Earth's surface can intensify explosive eruptions. 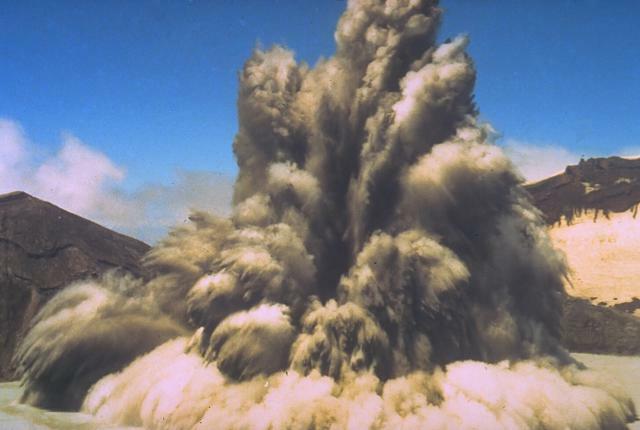 Steam-driven explosive eruptions, known as phreatic eruptions, can occur when an ascending magma body encounters groundwater. The ensuing eruptions often do not involve any ejection of new magma, but rather the fragmentation and explosive expulsion of pre-existing rock along the path of the volcanic conduit. Phreatic eruptions are gradational into magmatic eruptions, and many eruptions in fact involve the ejection of both old and new volcanic materials and are referred to as phreatomagmatic. Phreatic eruptions are sometimes accompanied by pyroclastic surges, dilute laterally moving clouds of gas, ash, and rock that sweep radially away from the vent. 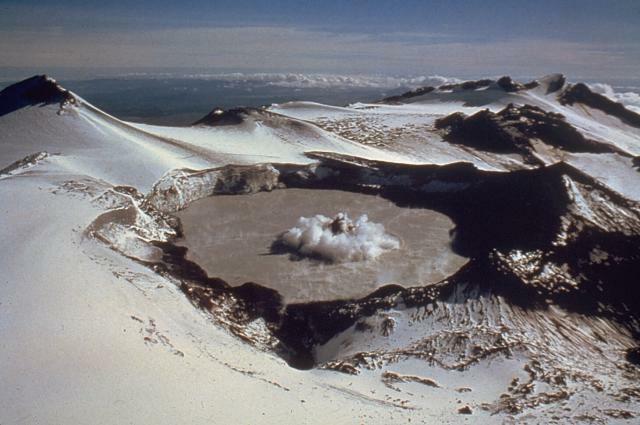 A small phreatic eruption on February 29, 1980, produces a column of ash and steam above Ruapehu's Crater Lake. A darker central plug is surrounded by a white ring produced by pyroclastic surges traveling across the lake surface. This view is from the NW, with Mitre Peak at the upper left. A series of small phreatic explosions had begun December 5, 1979, and lasted until April 15 of the following year. 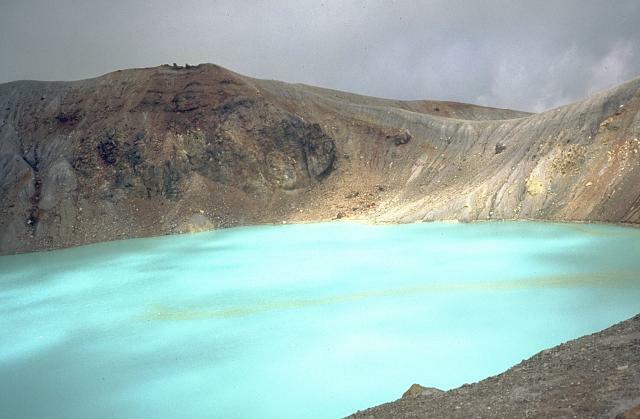 Photo by Peter Otway, 1980 (New Zealand Geological Survey). 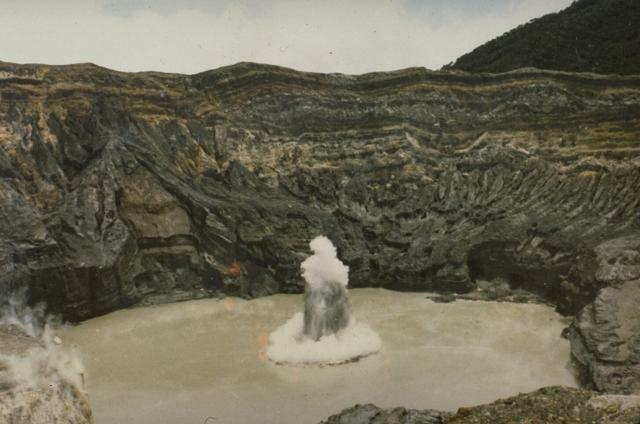 The interaction of magma and water can produce strong phreatic (steam-driven) explosions, such as seen in this 1980 photo of New Zealand's Ruapehu volcano. Clouds of ash and steam trail from large ejected blocks in the eruption column. Laterally moving pyroclastic-surge clouds form a white basal ring above the surface of a crater lake. 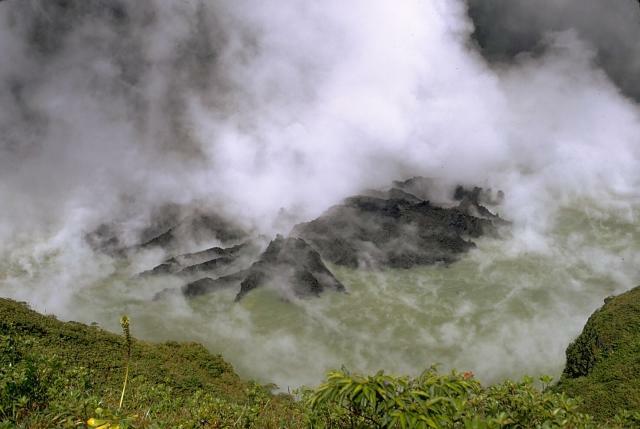 Phreatic or phreatomagmatic explosions are common at submarine volcanoes, crater lakes, and other places where hot magma (or associated gases) encounters surface water or groundwater. Photo by Hollick, 1980, courtesy of Bruce Houghton (Wairakei Research Center). 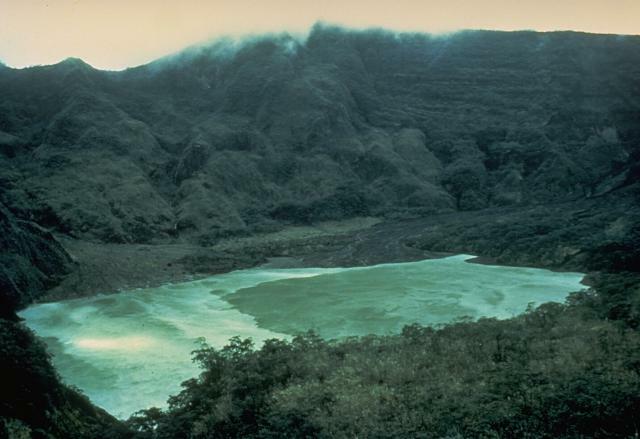 A geyser-like ejection of steam and ash rises above the surface of the crater lake of Poás volcano in July 1977. The white ring at the base of the eruption column is a steam cloud that is traveling laterally away from the vent along the surface of the crater lake. 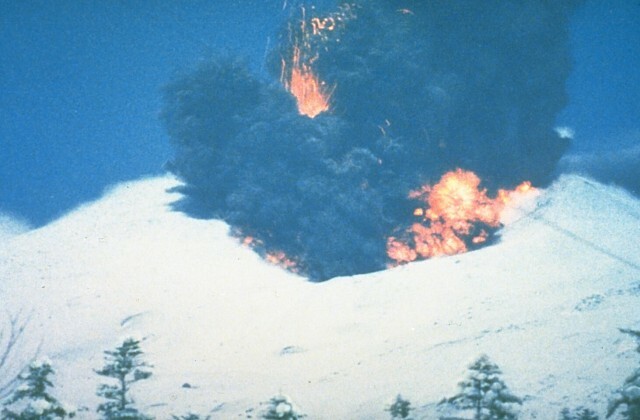 Mild phreatic explosions such as this one were typical of an eruption that began in May 1977 and lasted at least until July. The crater walls rise about 250 m above the lake. Photo by S. Racchini, 1977 (Universidad Nacional Costa Rica, courtesy of Jorge Barquero).